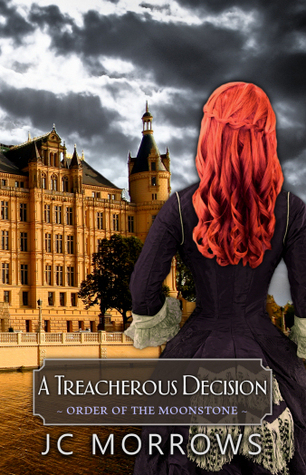 I am reviewing A Treacherous Decision, the second book in the Order of the MoonStone series by JC Morrows. Kayden’s mission should have been simple – she was sent to kill the prince . . . not to fall in love with him. Within the palace walls, Kayden has discovered that things are not as she expected. Is there more to the royal family, or . . . is there a more sinister depth to Drey’s mission? Dvarius thought his mind was made up – but will he have the resolve to see it through? Between attacks from outside the palace – and within, will the Prince live long enough to choose his Queen? And will Kayden choose to follow her head . . . or her heart, knowing that her decision could very well make her a target as well! A Treacherous Decision… book 2 in the Order of the MoonStone series by JC Morrows – Tweet this! JC Morrows is an amazing writer! I was drawn into this story immediately — Kayden lying on a hospital bed, with Dvarius sitting beside her, not knowing if she would recover. Oh, my goodness! I felt as if I were in the room with them — and I didn’t stop reading until the end. Actually, I was perched on the edge of my chair — unable to sit still, at least through the first few chapters. I was thrilled to learn that book two picks up where book one ended — with Kayden getting stabbed! I read somewhere that it isn’t good form to end a book on a cliffhanger, but I remember all my favorite television shows ending on a cliffhanger; good grief — some of them ended the season that way! Does anyone else remember watching Dallas, when JR was shot? I don’t mind a cliffhanger. For me, it adds thrill and intrigue to the story . . . and makes me eager to read the next book in the series. There are lots of secrets in books one and two that haven’t been revealed, but that just makes it more exciting to read. Will Kayden survive? Will she be the new Princess/Queen? Who else is in the castle, intent upon killing the Prince — or was Kayden the intended victim? I can’t say . . . I really can’t. If you enjoy YA fantasy, suspense, intrigue, and romance — whatever you do, don’t miss this series! A Treacherous Decision… Buy it. Read it. You’ll love it. – Tweet this! I am honored to feature JC MORROWS on my bookshelf blog. Don’t miss this opportunity to win a book by JC Morrows! – Tweet this! And tell all your friends about this contest! JC Morrows is being featured this month on Donna’s BookShelf! – Tweet this! Thank you for joining me for this exciting Author Spotlight! JC Morrows is a new, inspirational-romance-speculative fiction author. She has released six stories from the Order of the MoonStone series . . .
She is a home-schooling, skirt-wearing, coffee-drinking, blogging mother of two and part-time designer for the publisher of her own books — S&G Publishing. She thought it was perfectly normal to hear the voices of characters in her head, to see otherworldly visions all around her, to live in her own story worlds during quiet times… and sad times — but then she grew up and the world told her to put away those “childish things” so she got a job and learned how to be an adult. But GOD had a plan for her and the stories never really stopped… they lay dormant for a time — waiting until she was ready to hear them again. Now she happily spends most of her time living in a fantasy world of her own making. She regales those around her with tales of aliens and villains, epic wars and war-torn kingdoms struggling to rebuild — and whenever possible, she gets those stories down on paper (or on her computer at least) so that one day… she can share them with you as well. 1) JC, my readers are very excited about the Order of the MoonStone series. We hear great things about the newest short story coming out in June. How many other stories can we expect in the series? Can you tell us anything about them? 2) How do you come up with such fantastical stories? Honestly I don’t know. God has blessed me with a gift for storytelling… they just come to me. 3) Do you have any problems making dystopian / speculative / fantasy / steam theme stories “inspirational” stories? 4) Then why do so many authors feel that they have to put bad language, bad habits, and bad situations in their books? I have my own opinions about that – and they’re mostly negative so I won’t go into detail. What I will say is this – even among mainstream authors, there is a consensus that a story does not need profanity or inappropriate sexual relations to be a good, well-written, entertaining story. 5) Have you written other stories? other series? What can your readers expect from you after the Order of the MoonStone is finished? Oh… SO MANY! In November of this year, I am set to release the first in a new series. We’re not sure yet whether it will be a duology or a trilogy, but there will definitely be more than the one book: Life After E.L.E. I am also in the middle of rewriting my alien abduction series and hope to release it in late 2017 or early 2018. 6) I know you’ve been asked this before, but for those who don’t know . . .please allow me to ask again. “JC Morrows” – is that your real name, or a PEN name? If it’s a pen name, what is your reason for not using your real name? It’s my pen name. The reason is simple… my real name just doesn’t sound like a speculative author. “JC Morrows” does. 7) Can you share a few things from your “bucket list”? Yes! I have always wanted to travel to the Emerald Isle – explore the land of my heritage. That’s at the top of my list… ALWAYS! At the moment, my biggest wish is to get my kiddos out of our tiny apartment and into a house with a real yard where they can run and climb and just be kids – for the few years left they’ll actually want to do those things. Favorite time of year – Winter! Favorite hobbies – Reading, playing board games with the fam! Favorite dessert – Anything chocolate! Thank you, JC… and God bless you! You can find JC on her WEBSITE, at FACEBOOK, TWITTER, GOODREADS, and AMAZON. Don’t miss my interview/spotlight with the amazing JC MORROWS…today on Donna’s BookShelf. – Tweet this! to let you know what you need to do to collect your prize. Today I am reviewing A Treacherous Decision, the second book (4th story) in the Order of the MoonStone series by JC Morrows. Don’t forget to click below to find out how you can enter the GIVEAWAY contest! JC Morrows Marathon | Giveaway!